Islamist Watch maintains an extensive database of news articles concerning Islamism. The links below are a small sample. For a complete list of articles by date, please click here. Also, please click here for a listing of "creeping dhimmitude" articles by topic (see box at right of page). To receive these updates by email, please join our mailing list here. Lawful Islamism is a radical and supremacist interpretation of Islam that seeks to destroy Western society from within -- culturally and politically rather than violently. Methodically and patiently. With words not bullets. Activism not bombs. The goals of Lawful Islamists and Islamic terrorists are the same. Only their methods differ. 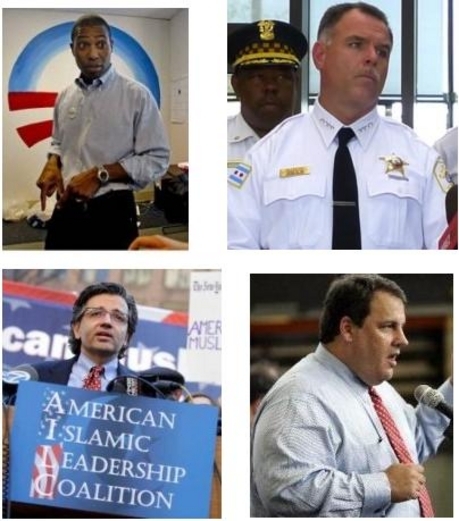 Clockwise from top left: Tony West went from representing the American Taliban, to Obama's 2008 campaign, to the number three position at the Justice Department; Chicago Police Superintendent Garry McCarthy held a fundraiser for the radical Islamist Group CAIR; New Jersey Governor Chris Christie has an Islamist Problem; and Dr. Zuhdi Jasser of the American Islamic Forum for Democracy spoke out in support of the NYPD. Last October, the Obama administration confirmed it was eliminating all references to Islam in law enforcement and national security training materials, which some Islamist groups claimed were offensive to them. "I want to be perfectly clear about this: training materials that portray Islam as a religion of violence or with a tendency towards violence are wrong, they are offensive, and they are contrary to everything that this President, this Attorney General and Department of Justice stand for," said U.S. Attorney Dwight Holton. "They will not be tolerated." "Governor Christie's Dirty Islamist Ties," Daniel Greenfield. Sultan Knish, January 16, 2011. "Chris Christie Has a Muslim Problem," Terry A. Hurlbut. Conservative News and Views, June 28, 2011. "Pennsylvania Judge Throws Out Charge For Harassing Atheist While Calling The Victim A Doofus," by Jonathan Turley. Res Ipsa Loquitur, February 24, 2012. (Includes video of the assault. The First Amendment protects the freedom of speech of all American, even "doofuses." "U.K. Thought Police Send Man to Prison," Bruce Bawer. FrontPage Magazine, March 14, 2012. (Analysis of the Gainsborough case. Notes a "chillingly Orwellian understanding of the concept of freedom, which has its roots not in Magna Carta or the Enlightenment but in Sharia. When [prosecutors] say that it is 'essential that everyone in our community is free to live without harassment,' [they] mean nothing more or less than this: that it is the right of Muslims in Britain to live in a society free of criticism of their religion."